Believe it or not, summer is here! Well, it is for all of us who live in the Valley of the Sun. I love the warm weather; the long days, the backyard bbq's, cool lemonade and a big scoop of ice cream on an especially hot day like today (it is supposed to be 100 degrees, again!). I also love incorporating seasonal produce any way I can during this time of year. There is an abundance of seasonal fruit available, creating inexpensive, colorful, and beautiful options for entertaining. Limes pair great with other shades of green, and look exceptionally well next to chocolate brown, gold, and shades of white. There are also numerous recipes to try this season, all infused with (you guessed it!) LIMES! The most basic lime recipe that I use quite frequently, is to simply slice limes into round wheels and drop them in a large pitcher of ice water. The result is a refreshing and colorful glass of H2O! My Favorite: Lime-Margarita Cupcakes, via Everyday with Rachel Ray. Mmmm...looks like I'll be doing some baking in the near future. These recipes sound so tasty! 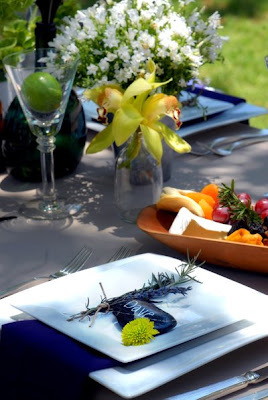 If you are interested in more entertaining ideas or someone to plan your next outdoor event, please contact Life Design Event Planning for more information.